This is a ritual from the 15th century Munich Manual of Demonic Magic titled De Responsione Spirituum, or “On the Response of Spirits”. 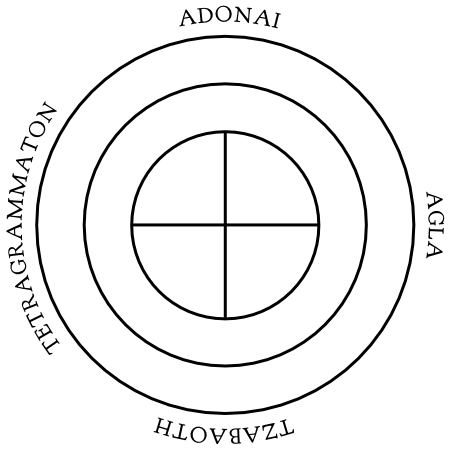 The ritual, which appears to be derived from Solomonic rituals, only sets up the area for summoning demonic or diabolical spirits, but does not address or conjure them specifically; that charge, I assume, would be up to to the conjurer. It’s not as involved as a full-on Solomonic ritual space, though, and can be done faster and with less hassle. Since the ritual references adversarial entities, as does the title of the grimoire itself, this ritual should probably only be used for conjuring demons, ghosts, or other such spirits. In keeping with my other texts, I’ve changed the spelling of the Hebrew names “ADONAY” and “SABAOTH” to “ADONAI” and “TZABAOTH”, respectively. The text also suggests two companions to be present, probably as assistants, guards, or magical spotters in case something goes awry. I make this circle in the name of God the omnipotent Father, who alone created the universe by the Word. I make this circle in the name of the living God, who redeemed the human race with human blood. I make this circle in the name of the Holy Spirit, the Paraclete, who illuminated the hearts of the apostles and prophets by his grace. The grace of God drive off all evil from us, by this sign of the Holy Cross. The summoning area, assuming you actually draw the cross in the circle, should look like the following diagram. Otherwise, it should just be three concentric circles. I produce this incense in the name of the Father, the Son, and the Holy Spirit. I adjure you, King of Kings and Lord of Lords, O eternal and unchanging God, understand now my call, my spirit, and the groans of my heart, and that I may rest in you, my Savior. Give me a holy and honest understanding, and withdraw from me all that which is evil; grant me growth, transforming me in all your goodwill by which you formed and saved me. Hear, O Lord, the prayer I have cried out to you, and hear me. Reveal and illumine my eyes, my mind, and my flesh, that I may subside and understand your miracles. Enliven me in your justice, that I may prevail in gazing upon my enemies and upon the Devil. After this, make an oration to the spirit to be called up, probably from another text in the Manual or some other grimoire. Before you do so, establishing a protective area around yourself and outside the summoning area might not be a bad idea, depending on the spirit being conjured.